I found these at the flea market this morning. All but the two Splitdorfs have multiple electrodes. I’m not a collector. What is a reasonable price to ask for them? Others may weigh in, but I usually sell green Splitdorfs like that for $10-20 depending on condition. The blue one looks like a Nor-West. Although cool, not particularly rare or valuable- maybe $10-15. The others I usually sell for a dollar or two or give away to new collectors. Is the Champion a "Gas engine special"? That would make it a little more valuable. The best part is that these are different and display well. It could be the beginning of a new collection. They are fun to collect and you can do so without spending a lot of money...or you can spend a lot of money if you so choose. Agree, good Splitdorfs with the green cap are usually at the price Chris suggests. 1/2 pipe thread are the most popular. Actually they are not known to run well so are good collectors items but not so good to run in old cars. Under the green cap there is a wrapped mica core. The big dark blue insulator plug is a Benford's Golden Giant. It originally had a decal label on it that is now missing. The body of the plug also was washed with a thin gold plating. They are actually quite common, even in NOS condition with the plating and decal intact. They turn up often at swap meets and on ebay. The Gas Engine Special is a plug that would be popular with the stationary engine crowd however the one you have is a much later variety. Still it would probably be a good plug to run in an old engine. Why not start a collection? I've been at it for over 40 years and am still finding them. Lost track of the number in my collection. A quick forum search may turn up some photos of plugs from my collection that I posted a while back. Happy collecting! Personally, I have avoided collecting spark plugs. I have to draw the line somewhere? However, I have seen photos of Terry B's collection. MOST impressive! Note, I SAY I don't collect them, however, I probably have thirty to fifty collectible plugs (not counting the several sets I have to run in cars). Somehow, from time to time? They seem to find me? Same here. 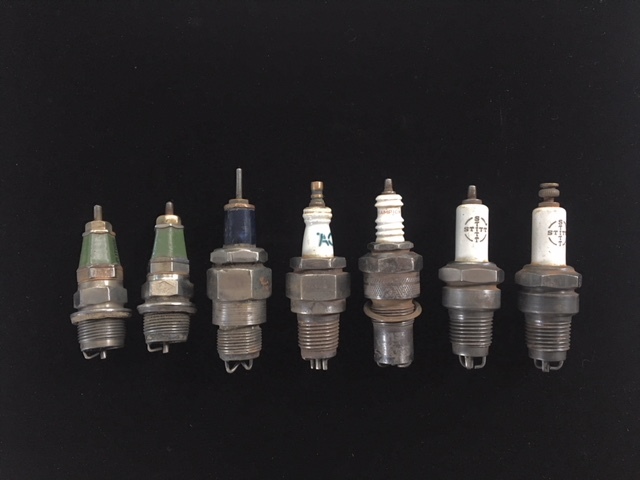 I don't collect them, but somehow I've gathered up a bunch of different Model T plugs. There must be even more different plugs for the Model T than there are timers. Sorry to hear the Splitdorfs don't perform well. I like the look and had thought of building a set for the runabout but I guess I won't bother now.